We are a cricket team based in the picturesque village of Youlgrave which is situated in the beautiful Derbyshire Peak District. We are a very friendly club which is always looking to welcome new players to the club no matter what their age or ability. 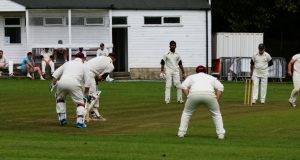 The club currently has three teams which play a mixture of competitive league cricket on Saturdays in the Yorkshire and Derbyshire league as well as friendly cricket which takes place on Sundays and during the week with our midweek team. All of our fixtures are played in North East Derbyshire. Our fixtures begin in April and finish in September with our home matches all being played at Alport Lane. The address for this can be seen in our contact details page. The club is winter trains ahead of the cricket season. We have net sessions which take place every Wednesday from 20:00 until 21:00 at Cricketal. For anyone looking to take part and are unsure where the centre is please see address below. The club is always looking for new players of all ages and abilities. Please contact us via email or through our twitter account which are listed under our contact details section. During March and early April the club will be holding a number of preparation days which help the club to get ready for the new season. Preparation days involve anything from hoovering the pavilion to maintaining sight screens. There are a number of jobs which we will be undertaking this season including renovating our scoreboard, repairing guttering and painting amongst other things. If you feel you can help us in any way then please contact us and the club secretary will inform you of the dates and times we will be at the ground. Like every club Youlgrave Lodge is always on the lookout for sponsorship which all goes towards maintaining and improving facilities at the ground. If you feel you or anybody else are able to help the club with this then please get in touch via our clubs email address listed below. We are very proud of our cricket club and the history of the it can be traced back to 1984 when Dave Tarlton had the idea to form this Cricket Club. Dave worked in the Accounts Section of the Pensions Centre at Pioneer House, Wingerworth, Chesterfield. The idea was nurtured by Dave’s immediate work colleagues Chris Jennings and Steve Yates initially but the idea really took off when John Shackleton, Ken Wilde, Graham Bond and Jon Eaton came on board. The nucleus of the team was there and it didn’t take too long to recruit the other members. All 7 matches in the Club’s inaugural Season of 1984 were Friendly fixtures and had to be played away. The cricket equipment was borrowed from AGD CC for whom a number of the team had played in previous years. BT Pensions CC was formed as a Mid Week team and played Friendly matches for the first two seasons before joining the Chesterfield and District Mid Week Works League as it was called then in 1986. The home ground for that season was at Dark Lane, North Wingfield. The Club moved to Langer Lane the following year, remaining there until the relocation to Highfield Park in 1992. Duckmanton Lodge was the next home venue in 1996 and remained so until the move to Youlgrave in 2007.